In 1955, the citizens of Taylor County, Florida, decided to stage a county-wide "Pine Tree Festival" as an educational tool to reduce forest fires that were crippling the county's economic base-the timber industry. 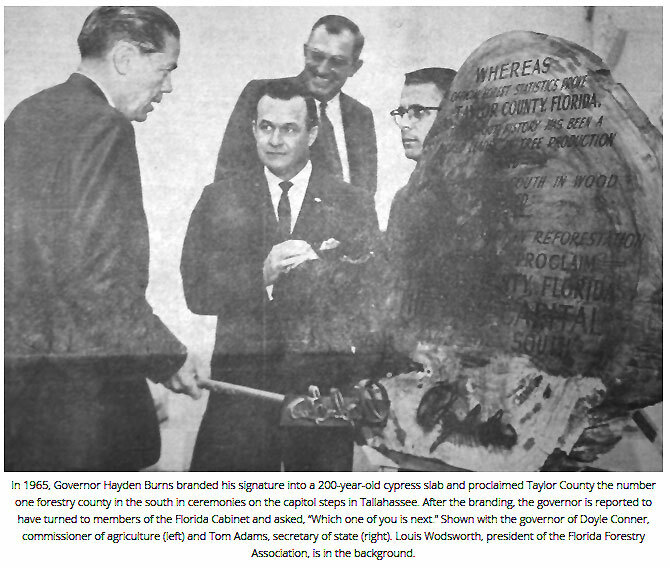 Over the years, the festival grew and accomplished its aim so well that by 1965, Taylor County could boast the lowest fire record in the nation, prompting then Florida Governor Hayden Burns and the Florida Cabinet to proclaim Taylor County the "Tree Capital of the South," a distinction it still holds. U.S. Congressman Don Fuqua made the same proclamation on the floor of the Congress. At the urging of Governor Burns, the Pine Tree Festival then became known as the Florida Forest Festival, the name it has had to this day. The goal of the Florida Forest Festival became, and remains that of promoting the benefits of the state's forests and to celebrate those who work in them as well as those who protect them.